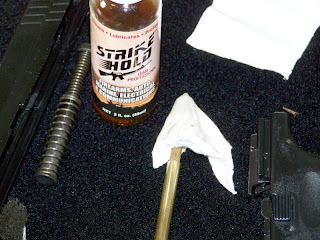 At the Indy Blogmeet, Mr B was passing out sample bottles of Strike Hold, a Cleaner/Lube/protectant product. I cleaned our two XD40's--The Strike Hold did seem to work quickly, but neither gun had more than about 30 rounds since it's last cleaning. Today I cleaned my main centerfire range gun, a 4" XD 9mm. I don't clean this gun all that often--I'm lazy, it isn't a self-defense gun, and even with quite a few hundred rounds between cleanings it has never malfunctioned. I ran a patch dampened with Strike Hold through the barrel with a jag, scrubbed the feed ramp and lugs a bit, then used a toothbrush, the damp patch and an old sock on the rest of the gun. I then ran a dry patch through the barrel again, and it came out dirty, as you'd expect. The surprising thing was that the next wet patch and the dry patch after came out clean. With Hoppe's or Break-Free CLP, it generally takes several more rounds of wet/dry before the patches come out clean, using a lot more cleaner. (Mr B said to use less of it than I would CLP, so I did) Pictured is the second patch damp with Strike Hold, after it had been through the barrel. I will be buying more Strike Hold once the free bottle runs out--however, with the little bit needed, that might be quite a while. Idiotic semi-mandatory FTC disclaimer: The 2 oz bottle of Strike Hold was a free sample that Mr B. gave to many of the Blogmeet attendees, without asking anything in return. make sure that you wipe the rails and other moving parts with it, then WIPE THEM DRY. It is a dry lube as well as a cleaner and a metal protectant. Use it on blued steel firearms to keep rust from happening, especially fingerprints. It'll clean slightly rusted steel too. Be sure and wipe all surfaces dry.